Maria Teresa de Filippis started racing Fiat 500s at the age of 22 after her brothers bet her she could not drive fast. In 1954 she finished second in the Italian sports car championship and, as a consequence, Maserati took her on as a works driver. 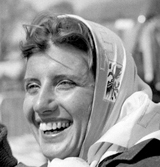 In 1958, driving the car in which Juan Manuel Fangio had won the previous year's drivers' title, she became the first woman to take part in a World Championship Formula One grand prix in Belgium, where she finished tenth. Fangio himself worried she drove too fast, but she encountered little prejudice among fellow drivers, although she was barred from competing at the French Grand Prix where an official told her: "The only helmet a woman should wear is the one at the hairdresser's." In all, she took part in four races that season, and as a result was offered a drive for Jean Behra's Porsche team in 1959. But Behra's death in August 1958 led to her reconsidering her future and she quit. "Too many friends had died," she told the Observer in 2006. "There was a succession of deaths - Luigi Musso, Peter Collins, Alfonso de Portago, Mike Hawthorn. Then Behra was killed in Berlin. That, for me, was the most tragic because it was in a race that I should have been taking part in. I didn't go to the circuits any more. The following year I got married, then my daughter was born and family life became more important." In 1979, after two decades away from the racing world, she joined the International Club of Former F1 Grand Prix Drivers. She became the club's vice-president in 1997 and was also president of the Maserati Club.